We know that many people take coloring seriously, using it as a way to escape the stress of daily life. Specifically designed for more experienced colorists, this exciting new series presents highly detailed illustrations based on today's most popular and sophisticated themes, from mandalas and mosaics to flowers and animals! The Greeks and Romans introduced a style of design that began with simple pebbles and colored stones. This stained glass collection offers 16 modern examples of mosaic art, bursting with spiraling pinwheels, exploding geometrics, undulating waves, and more. Remove the perforated pages from the book after coloring and hold up to a light source for a glowing effect. 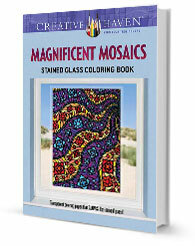 Specially designed for experienced colorists, Magnificent Mosaics Stained Glass Coloring Book offer an escape to a world of inspiration and artistic fulfillment.